Deepwater was developed by Dr. Wayne F. Buck, Assistant Professor of Business Ethics at Eastern Connecticut State University. 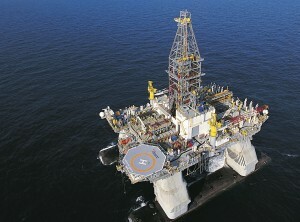 Players (teams or individuals) manage an oil exploration and production company operating in the deep offshore waters of the Gulf of Mexico. Incorporates a proprietary mathematical model of drilling and production operations of offshore deep water oil rigs and oil company financials. Player decisions include volume of oil production, spending on equipment maintenance and safety, crew scheduling, crew training, equipment overhauls, spending on lobbying, debt management and bidding at auction to acquire additional oil rigs. Simulation operational results include actual crude oil production, worker injuries and fatalities, blowout events, crew hours worked, equipment condition metrics, government safety inspections, social cost of environmental damage. Players compete against each other, not a computer. Financial results include full income statement and balance sheet, and abbreviate cash flow statement. Unlike other ethics experiential exercises, Deepwater is not constructed around arbitrary, ad hoc ethical dilemmas. Players make ordinary, day-to-day business decisions in a hazardous industry trying to balance pursuit of profit against risk of harm to workers, the environment and society. The Deepwater business ethics game immerses players in the complexities of business decision-making while managing morally perilous business activities. Deepwater exposes players to the uncertainties and ambiguities of business decision-making. Deepwater game players experience the conflict between profit-making and doing the right thing. Deepwater prepares players to handle the ethical complexities of business decision-making and sharpens their perception of ethical risk. Deepwater doesn’t tell players that ethical relativism is wrong, it shows them. At the same time, Deepwater demonstrates to players that it is not easy to decide what is right and wrong – and not easy to act ethically.